Pumpkin-carving took place right before Halloween this year and Chris did an awesome job with his expert tools and Cam's approval. Cameron actually celebrated the treating 3 different times this week! On Friday, our little "Fonz" rode on the school bus with his leather jacket, slicked back hair and a bag full of chocolate. Later that afternoon, Jane & Grandma took Cam over to Chris' office where employee's children can trick-or-treat at everyone's office desk inside! 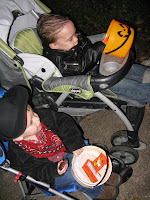 It was lots of fun to see other kids dressed up and pick up a few pieces of candy along the way. Luckily for Cam, his godmother, Auntie Jo decided to bring Will over on Saturday so that the two buddies could celebrate Halloween together. Cam is shown here teaching Will the fine art of checking to be certain your parents haven't removed the candy that you just worked so hard at putting in your candy pail. Hope everyone had a very happy Halloween!